Get away from it all! The environmentally friendly way to experience some of the World's most beautiful nature trails. 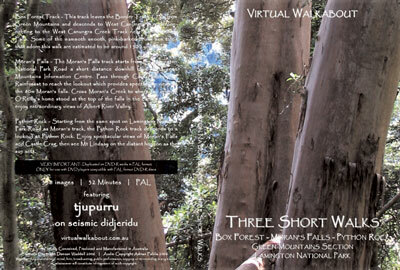 These multimedia artworks recreate nature walks for viewers as streaming slideshows, featuring hundreds of photographs, accompanied by the wonderful melodies and ongoing urging sound of the didjeribone (slide didjeridu) and Face Bass performed by tjupurru. Note: Didjeridu is sometimes spelt didgeridoo, didjeridoo and didgeridu, but the Australian government and all its agencies have formally accepted didjeridu as the correct spelling. The collection so far visually documents walking tracks in selected Australian National Parks and Nature Reserves, including many amazing walks through World Heritage areas. Often narrow trails traverse very sensitive and fragile areas. Viewers are strongly discouraged from physically visiting these off-the-beaten-track areas themselves, thereby exerting further pressure on them. 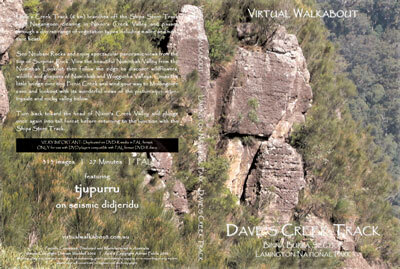 Hopefully many folk will be satisified with an environmentally friendly Virtual Walkabout, especially one free of sunburn, rain, annoying flies, biting midges, blood-sucking leeches, parasitic ticks, poisonous snakes and spiders and stinging trees. I had all that fun! 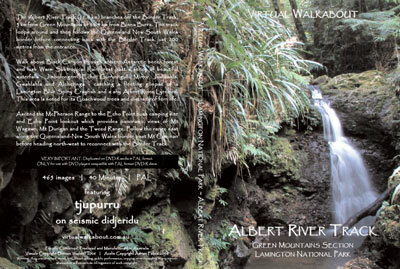 The Albert River Track (11.6 km) branches off the Border Track, 5 km from Green Mountains or 16.4 km from Binna Burra. The track loops around and then follows the Queensland New South Wales border before connecting back with the Border Track just 200 metres from the entrance. Walk above Black Canyon through ancient Antarctic beech forest and lush Warm Subtropical Rainforest past a series of beautiful waterfalls - Jimbolongerri, Echo, Gurrunngulli, Mirror, Joolbahla, Gwahlahla and Alcheringa - catching a fleeting glimpse of a Lamington Blue Spiny Crayfish and a shy Albert River Lyrebird. This area is noted for its Coachwood trees and diversity of fern life. Ascend the McPherson Range to the Echo Point bush camping site and Echo Point lookout which provides panoramic views of Mt Wagawn, Mt Durigan and the Tweed Range. Follow the range east along the Queensland-New South Wales border past Mt Cominan before heading north-west to reconnect with the Border Track. The 30 million year old lava domes of an extinct shield volcano in Queensland provide cool refuge for the largest stand of ancient cone-bearing Araucarias in the world today. More than nine different types of rainforest exist in this extremely biodiverse sanctuary, interspersed with open forests, woodlands and hundreds of 'balds', or pockets of open native grasslands. Once food for dinosaurs, the large pine-apple shaped fleshy bunya pine cones contain edible 'nuts' that were the focus of traditional aboriginal festivals. Custodians from Queensland and New South Wales would regularly gather for ceremonies, to make laws, resolve disputes, trade and feast. Step back in time from the Dandabah camping ground and enter the 'fridge' that exists atop the Bunya Mountains (Booburrgan Ngmmun) due to the tall closed canopy of ancient rainforest on the eastern slopes. Penetrate the barrier of prickly shrubs, vines and stinging trees to discover dark forests pierced by stabbing rays of light. This 21.4 km track which forms the backbone of most walking tracks in Lamington National Park connects Binna Burra and Green Mountains. The track winds its way through rainforest and patches of Antarctic beech forest. Warm Subtropical Rainforest, Cool Subtropical Rainforest and Cool Temperate Rainforest are all encountered along the way. Start at Binna Burra and ascend the Beechmont range to Joalah lookout, passing junctions to Tullawallal, Coomera and Ships Stern tracks. Enjoy views over Woggunba Valley before proceeding to the Mount Hobwee track junction. Then ascend the McPherson Range passing the Tuckeroo bush camping site and the ends of the Mount Hobwee and Coomera tracks before reaching Yargabullang lookout. Follow the range to Beereenbano and Mount Merino lookouts - with views of the Tweed Range and Mount Warning - and Chakoonya lookout with a view back over the Lamington area. 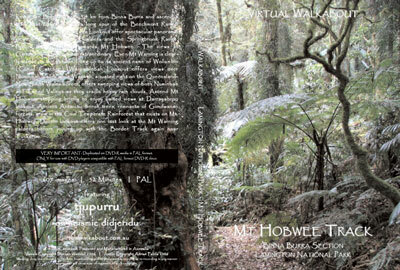 Continue along the range to Nyamulli and Wanungara lookouts before meeting the Toolona Creek track junction. Proceed to the Bithongabel bush camping site before descending to Green Mountains, passing junctions with Albert River, Box Forest and West Canungra Creek Tracks. 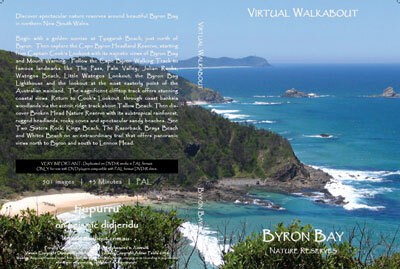 Discover spectacular nature reserves around beautiful Byron Bay in northern New South Wales. Begin with a golden sunrise at Tyagarah Beach, just north of Byron. Then explore the Cape Byron Headland Reserve, starting from Captain Cook's Lookout with its majestic views of Byron Bay and Mount Warning. Follow the Cape Byron Walking Track to famous landmarks like The Pass, Palm Valley, Julian Rocks, Wategos Beach, Little Wategos Lookout, the Byron Bay Lighthouse and the lookout at the most easterly point of the Australian mainland. The magnificent clifftop track offers stunning coastal views. Return to Cook's Lookout through coast banksia woodlands via the scenic ridge track above Tallow Beach. Then discover Broken Head Nature Reserve with its subtropical rainforest, rugged headlands, rocky coves and spectacular sandy beaches. See Two Sisters Rock, Kings Beach, The Razorback, Brays Beach and Whites Beach on an extraordinary trail that offers panoramic views north to Byron and south to Lennox Head. 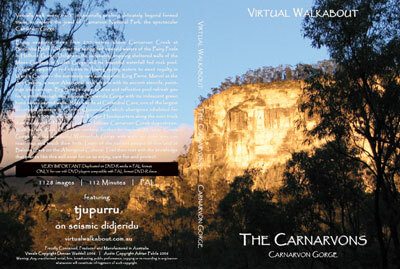 Virtually walk every track, occasionally probing delicately beyond formed trails, to explore the jewel of Carnarvon National Park, the spectacular Carnarvon Gorge. Enjoy sweeping views from 200 metres above Carnarvon Creek at Boolimba Bluff. Discover the spring fed emerald waters of the Fairy Pools in Hellhole Gorge. Delight in the constantly dripping sheltered walls of the Moss Gardens in Violet Gorge and its beautiful waterfall fed rock pool. Follow a carpet of red stones in flowing spring waters to meet royalty in Ward's Canyon - the extremely rare and majestic King Ferns. Marvel at the Art Gallery, a major Aboriginal rock art site with its ancient stencils, paintings and carvings. Big Bend's camping area and reflective pool refresh you for a stroll through the sinuous Boowinda Gorge with its iridescent green hued moss covered walls. Rest a while at Cathedral Cave, one of the largest decorated shelters in Central Queensland, which aborigines inhabited for more than 3500 years. 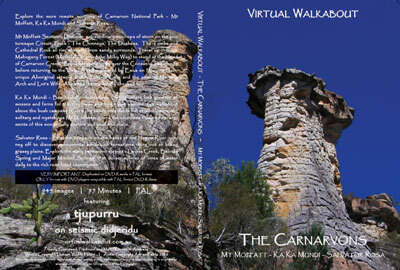 Explore the more remote sections of Carnarvon National Park - Mt Moffatt, Ka Ka Mundi and Salvator Rosa. Mt Moffatt Section - Discover extraordinary outcrops of stone on the picturesque Circuit Track - The Chimneys, The Duchess, The Tombs and Cathedral Rock all rise abruptly from sandy surrounds. 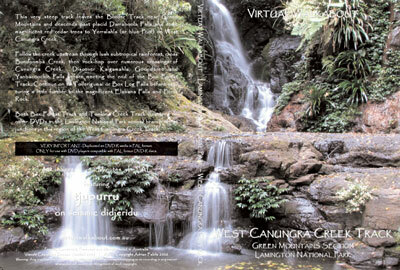 Travel up through Mahogany Forest (Mythical Origin of the Milky Way) to stand at the Head of Carnarvon Creek. Enjoy sweeping views over the Consuelo Tablelands before returning to the lowlands to be greeted by Emus on Marlong Plain, unique Aboriginal artwork at Kookaburra Cave and the amazing Marlong Arch and Lot's Wife. All campsites are briefly checked too. Ka Ka Mundi - Beautiful Bunbuncundoo Spring offers lush growths of mosses and ferns for the tiny birds and frogs that abound. Go walkabout above the bush campsite to view dry sandy creekbeds full of wildflowers, the solitary and mysterious Mt Mooloolong, and the countless coloured escarpments of this wonderfully austere place. The Coomera River Track (8.1 km) leaves the Border Track 1.9km from Binna Burra and passes through Subtropical and Warm Temperate Rainforest and giant Brush Box forest. The Coomera Falls lookout offers breathtaking views of the 160 metre deep Coomera Gorge and two magnificent waterfalls; Coomera (64 m fall) and Yarrabilgong. 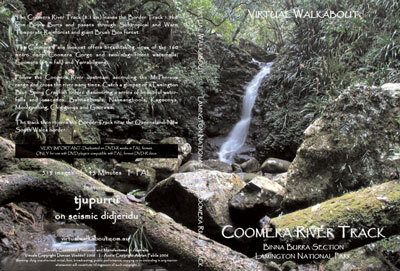 Follow the Coomera River upstream, ascending the McPherson range and cross the river many times. Catch a glimpse of a Lamington Blue Spiny Crayfish before discovering a series of beautiful waterfalls and cascades; Bahnamboola, Nahnangboola, Kagoonya, Moolgoolong, Chigigunya and Goorawa. The track then rejoins the Border Track near the Queensland-New South Wales border. Dave's Creek Track (6 km) branches off the Ships Stern Track near Nagarigoon clearing in Nixon's Creek Valley and passes through a diverse range of vegetation types including mallee and montane heath. See Neubani Rocks and enjoy spectacular panoramic views from the top of Surprise Rock. View the beautiful Numinbah Valley from the Numinbah Lookout then follow the ridge to discover wildflowers, wildlife and glimpses of Numinbah and Woggunba Valleys. Cross the little bridge over tiny Picnic Creek and wind your way to Molongolee cave and lookout with its wonderful views of the picturesque countryside and rocky valley below. Turn back toward the head of Nixon's Creek Valley and plunge once again into tall forest before returning to the junction with the Ships Stern Track. 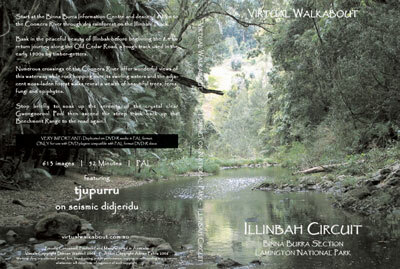 Start at the Binna Burra Information Centre and descend 8.2 km to the Coomera River through dry rainforest on the Illinbah Track. Bask in the peaceful beauty of Illinbah before beginning the 8.4 km return journey along the Old Cedar Road, a rough track used in the early 1900s by timber-getters. Numerous crossings of the Coomera River offer wonderful views of this waterway while rock hopping over its swirling waters and the adjacent moss-laden forest walks reveal a wealth of beautiful trees, ferns, fungi and epiphytes. Stop briefly to soak up the serenity of the crystal clear Gwongoorool Pool then ascend the steep track back up the Beechmont Range to the road again. Part of the traditional lands of the Gubbi Gubbi people, Kondalilla has special significance to Aboriginal people as communities would gather here for the traditional Aboriginal Bunya nut festivals every three years. The spectacular Kondalilla Falls takes its name from the Aboriginal word meaning 'rushing waters'. From tall open Eucalypt forest, the falls drop 80 metres into the lush subtropical rainforest valley below. Wind your way through picturesque forests of bunya pines,piccabeen palms and pink ash to stand at the pool and head of the falls. Descend through dense rainforest to the base of the towering falls then return to the top again via the circuit track as Wompoo fruit-doves watch from high in the trees above. 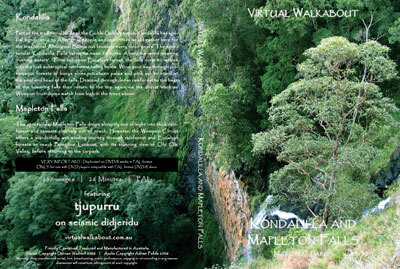 The spectacular Mapleton Falls drops abruptly out of sight into thick rainforest and remains elusively out of reach. However, the Wompoo Circuit offers a wonderfully wet winding journey through rainforest and Eucalypt forests to reach Peregrine Lookout, with its stunning view of Obi Obi Valley, before returning to the carpark. Leave the Border Track 5.4 km from Binna Burra and ascend a track that curves out on a long spur of the Beechmont Range. Orchid Bower and Araucaria Lookout offer spectacular panoramic views of the Mt Warning caldera and the Springbrook Range. Follow the spur back towards Mt Hobwee. The views at Garragoolba Lookout are extraordinary. Even Mt Warning is clearly visible on the horizon, living up to its ancient name of Wollumbin ('Cloud Catcher'). Warumblebah Lookout offers views over Numinbah Valley while Wagawn, situated right on the Queensland-New South Wales border, offers sweeping views of both Numinbah and Tweed Valleys as they cradle heavy rain clouds. Ascend Mt Hobwee, stopping briefly to enjoy limited views at Darrayabroo lookout. Ancient Antarctic beech trees, remnants of Gondwanan forests, grow in the Cool Temperate Rainforest that exists on Mt. Hobwee. Dacelo lookout offers one last look at the Mt Warning caldera before joining up with the Border Track again near Tuckeroo. 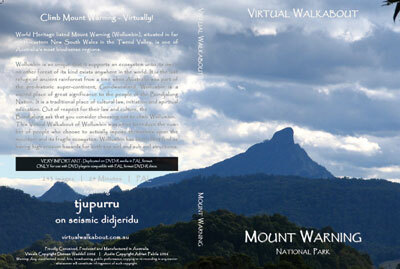 Climb Mount Warning - Virtually! World Heritage listed Mount Warning (Wollumbin), situated in far north-eastern New South Wales in the Tweed Valley, is one of Australia's most biodiverse regions. 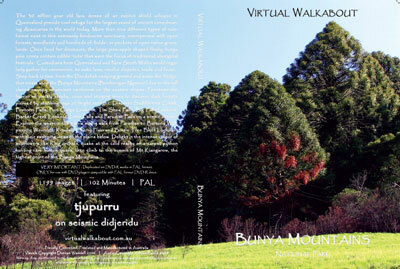 Bundjalung ask that you consider choosing not to climb Wollumbin. 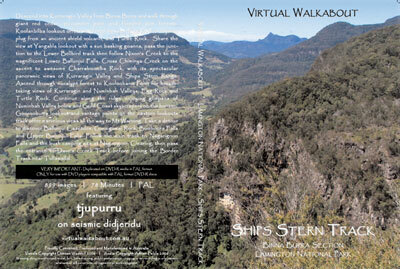 This Virtual Walkabout of Wollumbin may serve to reduce the number of people who choose to actually impose themselves upon the mountain and its fragile ecosystem. Wollumbin has been identified as having high erosion hazards for both top soil and sub soil structures. Dawn to dusk in South-East Queensland's spectacular Noosa National Park. 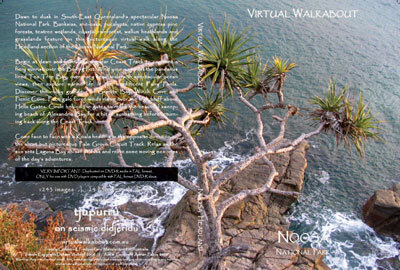 Banksias, she-oaks, eucalypts, native cypress pine forests, teatree wetlands, coastal rainforest, wallum heathlands and grasslands feature on this picturesque virtual walk along the Headland section of the Noosa National Park. Begin at dawn and follow the popular Coast Track to confront a fiery sunrise over the Boiling Pot. Wind your way past the pandanus lined Tea Tree Bay, over many headlands with spectacular ocean views, then explore marine life in the magnificent Fairy Pools. Discover the rocky grandeur of Granite Bay, Winch Cove and Picnic Cove. Face gale force winds rising over the high bluff above Hells Gates. Circle behind the gates to reach the beautiful sweeping beach of Alexandria Bay for a bit of sunbathing before returning back along the Coast Track. Come face to face with a Koala heading in the opposite direction on the short but picturesque Palm Grove Circuit Track. Relax as the sun sets Laguna Bay ablaze at dusk and relive some moving memories of the day's adventures. The Birthplace of Forest Activism! In August 1979 a contingent of 100 police arrived in Terania Creek to ensure a bulldozer could resume work on reopening a logging track to be used by sawmillers. However, courageous people stood firm in a protest that lasted for over a month, compelled to save a part of the largest single area of subtropical rainforest in Australia, the Big Scrub. In 1979 only 2% of the big scrub remained. 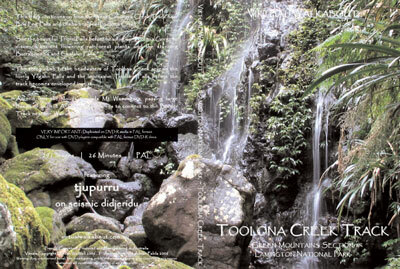 Terania Creek was the first time direct action tactics were used anywhere in the world in the defence of a forest. The image of somebody defying a bull dozer is somewhat cliche these days but in 1979 it was a bold new idea. The scientific debate that ensued had a profound impact on rain forest policy throughout Australia. 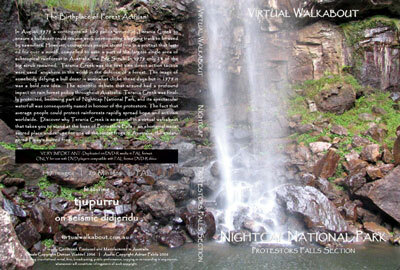 Terania Creek was finally protected, becoming part of Nightcap National Park, and its spectacular waterfall was consequently named in honour of the protestors. The fact that average people could protect rainforests rapidly spread hope and activism worldwide. Discover why Terania Creek is so special in a virtual walkabout that takes you to stand at the base of Protestors Falls - an aboriginal mens sacred place and refuge for one of the rarest frogs in Australia, the endangered Fleay's barred frog. Descend into Kurraragin Valley from Binna Burra and walk through giant red cedar, piccabeen palm and flooded gum forests. Koolanbilba lookout offers wonderful views of Egg Rock, a rhyolite plug from an ancient shield volcano, and Turtle Rock. Share the view at Yangahla lookout with a sun basking goanna, pass the junction to the Lower Bellbird track then follow Nixon's Creek to the magnificent Lower Ballunjui Falls. Cross Chiminya Creek on the ascent to awesome Charraboomba Rock, with its spectacular panoramic views of Kurraragin Valley and Ships Stern Range. Ascend through eucalypt forest to Kooloobano Point for breathtaking views of Kurraragin and Numinbah Valleys, Egg Rock and Turtle Rock. Continue along the ridge enjoying glimpses of Numinbah Valley below and Gold Coast skyscrapers on the horizon. Goorooburra lookout and vantage points on the eastern lookouts track offer marvelous views all the way to Mt Warning. Take a detour to discover Ballunjui Cascades, Guraigumai Rock, Booboora Falls and Upper Ballunjui Falls. Follow the main track to Nagarigoon Falls and the bush camping site at Nagarigoon Clearing, then pass the entrance to Dave's Creek Track before joining the Border Track near Tullawallal. Lower Bellbird Track - Starting 3.7 km along the Ships Stern Track, this track winds its way through dry rainforest passing large rock features adorned with ferns. Cross Rifle Bird Creek and Bellbird Creek before emerging at Egg Rock clearing. Ascend the Beechmont Range, catching glimpses back down Kurraragin Valley, to reach Binna Burra Road 500 metres downhill from the Information Centre. Caves Circuit - Beginning from the Information Centre this track offers great views of Coomera Valley, the Darlington Range and extensive areas of rainforest dominated by hoop pine. A short tunnel cut through volcanic rock reveals Kweebani Cave, once used extensively by the Yugambeh people. The track then climbs steeply up the range to emerge near Binna Burra Lodge and campsite. Tullawallal Circuit - The track leaves the Border Track 1.9 km from Binna Burra and leads to an elevated patch of cool temperate rainforest featuring ancient Antarctic beech trees at the summit, Tullawallal. Returning to Binna Burra via the Loop Track, discover fungi, ferns, figs and booyong. Box Forest Track - This track leaves the Border Track 1.7 km from Green Mountains and descends to West Canungra Creek, connecting to the West Canungra Creek Track near Yanbacoochie Falls. 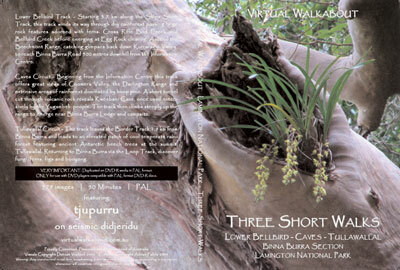 Some of the mammoth smooth, pink-barked brush box trees that adorn this walk are estimated to be around 1500 years old. Moran's Falls - The Moran's Falls track starts from the Lamington National Park Road a short distance downhill from the Green Mountains Information Centre. Pass through Cool Subtropical Rainforest to reach the lookout which provides spectacular views of the 80m Moran's falls. Cross Moran's Creek to where the original O'Reilly's home stood at the top of the falls in the early 1900s to enjoy extraordinary views of Albert River Valley. Python Rock - Starting from the same spot on Lamington National Park Road as Moran's track, the Python Rock track descends to a lookout at Python Rock. Enjoy spectacular views of Moran's Falls and Castle Crag, then see Mt Lindsay on the distant horizon as the sun sets. This track continues on from the West Canungra Creek Track near Box Log Falls and climbs besides Toolona Creek. See the beautiful Triple Falls before heading up Toolona Gorge to discover ancient flowering rainforest plants and the stunning Burraboomba and Chalahn Falls. The steep climb to the headwaters of Toolona Creek reveals the lovely Yilgahn Falls and the impressive Toolona Falls before the track becomes enveloped in mist. Ascend into the clouds towards Mt Wanungara, passing large clumps of ancient Antarctic beech trees to connect to the Border Track near the Wanungara Lookout. This very steep track leaves the Border Track near Green Mountains and descends past placid Darraboola Falls and some magnificent red cedar trees to Yerralahla (or blue Pool) on West Canungra Creek. Follow the creek upstream through lush subtropical rainforest, cross Bundoomba Creek, then rock-hop over numerous crossings of Cunungra Creek. Discover Kalgamahla, Goondaree and Yanbacoochie Falls before meeting the end of the Box Forest Track. Continue on to Tollerigumai or Box Log Falls before venturing a little further to the magnificent Elabana Falls and Picnic Rock. 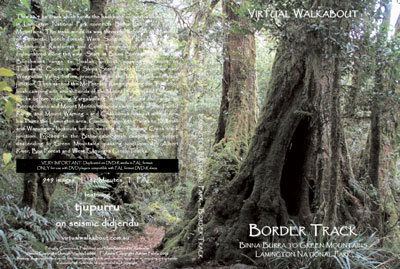 Both Box Forest Track and Toolona Creek Track (featured on other DVDs in the Lamington National Park series) branch off at junctions in this region of the West Canungra Creek Track.